Situated in this SOUGHT AFTER location. This SPACIOUS family home boasts a downstairs CLOAKROOM. LOUNGE with separate DINING ROOM. 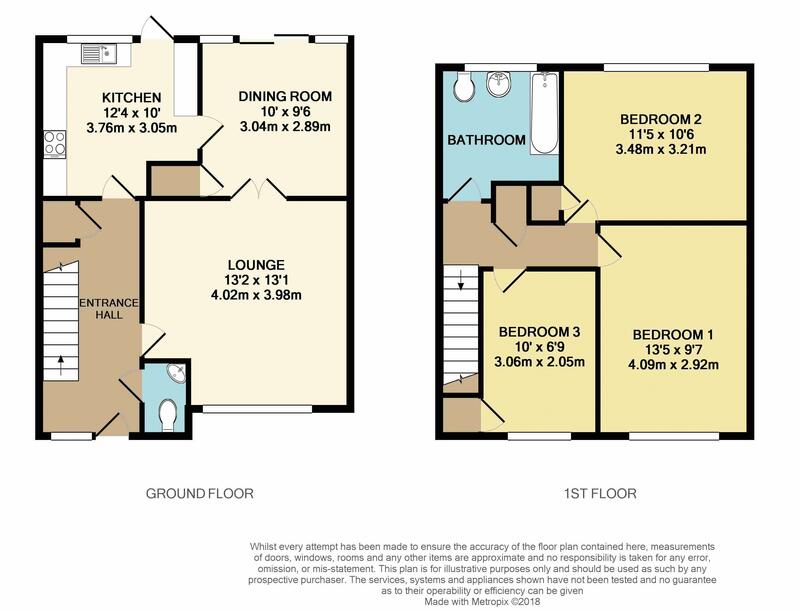 Fitted kitchen, THREE bedrooms and a family bathroom. Enclosed well kept gardens and a garage directly to the rear with further off road parking. All within easy reach of local schools and amenities. UPVC double glazed front door opens to the entrance hall, stairs to first floor with under stairs storage space, radiator, thermostat control, cloaks storage housing meters, radiator. Comprising low level WC, wash hand basin, tiled splash backs, radiator, double glazed window to the front. Fifteen panel glazed door to the lounge with double glazed window to the front, double radiator, TV point, bifold doors to the dining room. Double glazed sliding doors to the rear garden, radiator, storage cupboard, door to the kitchen. Fifteen panel glazed door opens to the kitchen comprising a range of base and eye level storage units, display cabinets, work surface areas with inset single drainer stainless steel sink unit set below glazed window to the rear, plumbing for washing machine, gas and electric cooker points, tiled surrounds, radiator, glazed door to the rear garden. Stairs to the first floor, access to the loft space, concealed wall mounted gas boiler serving central heating and hot water, door to the airing cupboard. Double glazed window to the rear, radiator, built in storage cupboard. Double glazed window to the front, radiator, built in storage cupboard. A white three piece suite comprising low level WC, pedestal wash hand basin, panel bath with Triton electric shower over, tiled surrounds, double glazed window to the rear, radiator. Situated directly to the rear of the property with up and over door, power and lighting, work bench. Additional off road parking for two cars to the front of the garage. Situated at the foot of the rear garden a brick built storage shed with power and lighting and work bench. Laid for ease of maintenance in mind with pathway to the front door, surrounding borders and hedge to the front boundary. A fully enclosed rear garden with paved patio to the immediate rear, laid mainly to lawn with established well stocked surrounding borders, outside tap and lights, gated rear access.